Immunogen: Synthetic peptide corresponding to the sequence near the N-terminus of rat angiotensin II receptor AT2. Crossreactivity: Predicted species reactivity based on epitope sequence homology: mouse, gerbil. Application Notes: Suitable for membrane-based ELISA. Predicted MW of ~41kDa. Higher MW species (~50kDa) also observed by Western blot which may reflect dimerization of the receptor. Scientific Background: The actions of the octapeptide circulatory hormone angiotensin II are mediated by type one (AT1) and type two (AT2) angiotensin II receptors, members of the seven-transmembrane domain-containing GPCR family. AT1 expression is greatest in vascular smooth muscle, liver, kidney, adrenal cortex, brain, and lung, and is primarily responsible for the physiological effects of angiotensin II in cardiovascular homeostasis. The AT2 receptor displays approximately 30% identity to the AT1 receptor, and is highly expressed during embryonic development. AT2 expression in adult tissue is limited to the adrenal medulla, brain, and reproductive tissues, but is upregulated in injured tissue following myocardial infarction, vascular injury, and wound healing. Western blot analysis: MW marker (1) and 20µg rat kidney membrane extract (2) probed with Angiotensin II Receptor (AT2) pAb at 6µg/ml. 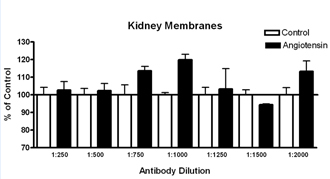 Membrane ELISA: Lewis rat kidney membranes (5µg/well) were treated with 1μM concentrations of agonist (Angiotensin II) and probed with Angiotensin II Receptor (AT2) pAb (1:250 to 1:2000 of a 1µg/μL stock solution) by ELISA. Data from vehicle treated cells were taken as 100%. Results are the mean ± SEM (n=2). Immunohistochemistry analysis: Rat brain nucleus tractus solitarius (NTS) fixed in 100% methanol, then stained with Angiotensin II Receptor (AT2) pAb at 1:1000.